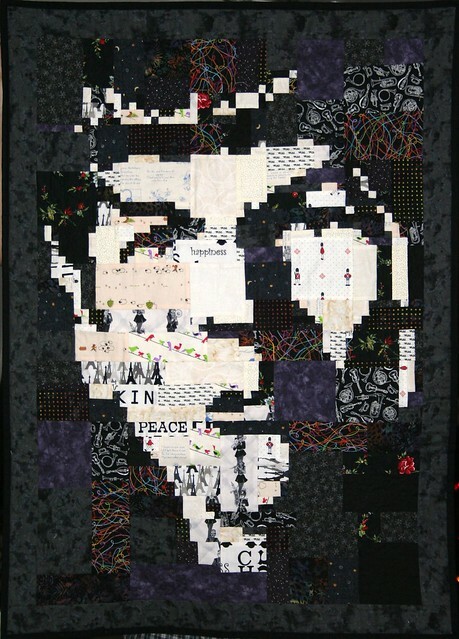 Way back in the Spring, I saw on Craft a post about a totally awesome Spock quilt. Event though there was a tutorial on how to design the quilt, I thought, gosh, I wouldn’t know where to start. I showed it to some co-workers who thought it was awesome and that it would be a great gift for our boss, who is a Trekkie extraordinaire. But ethics being what they are, it really wasn’t appropriate for me to make it for him. Fast forward to Octoberish when our boss announced his retirement in early December. I immediately thought of the quilt and did a search to find the post again. Lo & behold, not only did I find the original post, but I found that Carol, the brains behind the blog Funthreads, had started a really amazing, simple to follow, quilt-a-long! It made the whole project a lot less daunting. Carol’s quit-a-long makes a twin-sized quilt in eleven parts. I thought a wall-hanging would be much more appealing to our recipient (and also easier for me to complete! ), so I printed out each week of the quilt-a-long and wrote in new measurements for the pieces. If you want to change the size of a quilt pattern, do not skip this step! Have you ever tried to halve or double a recipe without re-writing the ingredient measurements? I ended up having to triple a batch of cupcakes just recently because I thought I could do the doubling math in my head as I went! When halving quilt measurements, be sure to take into account the 1/2 inch for seam allowances. Remove the 1/2 inch from the original measurement, divide the resulting number in half, then add the half inch back in. This will give you the correct (finished) measurement and your full 1/4 inch seam allowances all around. Also remember that when you halve both the width and height you are essentially making a quilt a quarter of the size of the original. I free-motion quilted my version of this pattern only in the black/dark parts to make Spock’s face stand out more. I also stuck mainly with white/cream and black/grey for the darks and lights. I have to say I am exceptionally proud of this project. Not only was my boss thrilled with his quilt, but I really enjoyed making it – always key. I’m looking forward to designing my own quilt next, using the Funthreads tutorial – I’m thinking a Dr. Who quilt in TARDIS blue next? Tagged 2011, black, December, Fascinating, free motion, Funthreads, gift, patchwork, pieced, Quilt, retirement, Spock, Star Trek, white. I think I know what R. is getting for Christmas next year.